Random orbit 1. The first version. 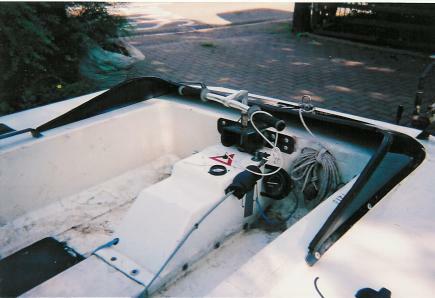 When I first got the hull, it had a large bench seat across the cockpit. As I wasn’t planning on taking passengers, it had to go. Racing hovers don’t generally have seats at all, you need to be agile and move around from side to side so I went with convention an fitted a centre console. I made an early decision not to hide anything important inside the console. If anything breaks, it’s important to be able to get at it as quickly as possible. You can see from the photo that the console has the master kill switch (inside the red triangle), the water temperature gauge, rev counter (on the right), steering cable and limit bolts. The handlebars are connected to a piece of 25mm steel tube with a nut welded to the bottom end. This nut is wound onto a captive bold that goes through the hull. You can see the top of the tube comes up through a slot in the console, an on through a bush in the folded steel mounting bracket. The white cable hung over the handlebars is the lanyard. The kill-switch is on the left hand side of the duct. The duct is 750mm internal diameter and as it’s an integrated craft, there is a splitter plate running horizonaly across the duct about 150mm up from the bottom edge. Any air going below the plate provides lift, any air above provides thrust. In the center is a cone to help smooth out the airflow as it passes the centre of the fan assembly and to hold the flow straighteners. Flow straighteners and generally regarded as “A Good Thing”. They are supposed to improve steering and help the airflow through the duct. They also do a good job of helping to keep the duct round, which is important, and I’m sure a host of other things. The flow straighteners I made for Random Orbit are unusual in that they sweep around the duct as well as curve down their length. 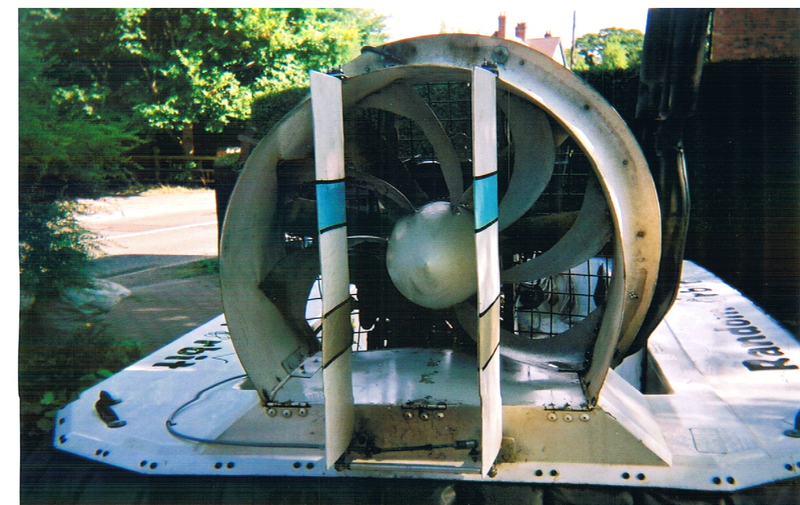 The idea was that air flowing off the fan blades should be straightened as gently as possible as each time you poke it you knock our some of the energy and I want as much as possible. It’s quite hard to explain a shape so take a look at the pictures. 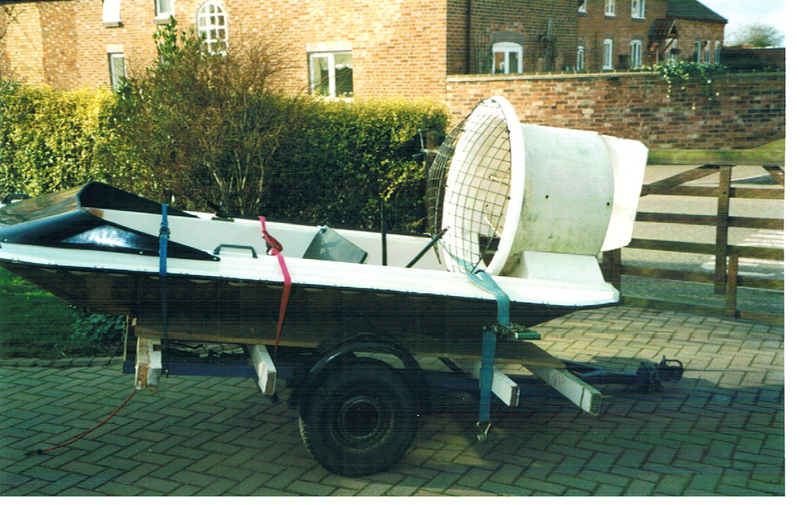 It was 1998 when I decided to build a hovercraft. 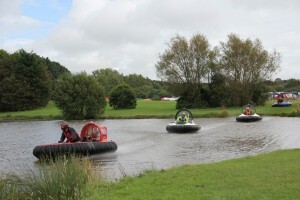 I’d joined the Hovercraft Club of Great Britain (HCGB) and been along to a few meeting and met a few people. After a while I started to notice the differences between craft and formed an opinion of what I was after. I spotted an advert in Light Hovercraft, the HCGB’s magazine for an old hover. It didn’t have an engine but it did have a duct, steering, a skirt and engine frame. At this point I didn’t have a tow bar or trailer so a quick phone call to Dad to see if he was up for a trip to Maidstone in Kent for the day. When we got there the craft was just as I’d expected so a quick look round and money changed hands. At this point I was told it had been used as a corporate craft, giving rides and training people to drive a hovercraft for fun. It was a Moto-Cyclone, around ten years old, originally powered by a Rotax 447, had a duel bench seat, side bar steering and a 750mm duct. From these beginnings I’ve had a great amount of fun. So much so that. I built this craft up from the hull twice, hence the version 1 and version 2 labels I given these pages. Just imagine, you’re racing down the back straight toward the water. You’ve got the throttle wide open, the engine is buzzing at ten thousand revs. As you get to the edge, shift your weight back a little and head out over the lake to the right of the buoy. There’s a craft stuck just off your line in the middle of the lake so you keep one eye on him to see which way he’s drifting. Round the buoy and heading down wind so you get your weight further back. Two craft come up behind on the outside, an F1 and an F2. They’re much more powerful and so get past. There’s a marshal on the headland waving a yellow flag frantically to warn you of something round the corner, just out of sight. As you speed into the inlet, you can see two F25s that didn’t make it up the bank. The two guys that just passed you have got the line wrong, gone wide and are trying to recover and there is just enough room for you. You back off the gas – but not much – shimmy the back round, open it wide again and get up the bank in front of the lot of them! 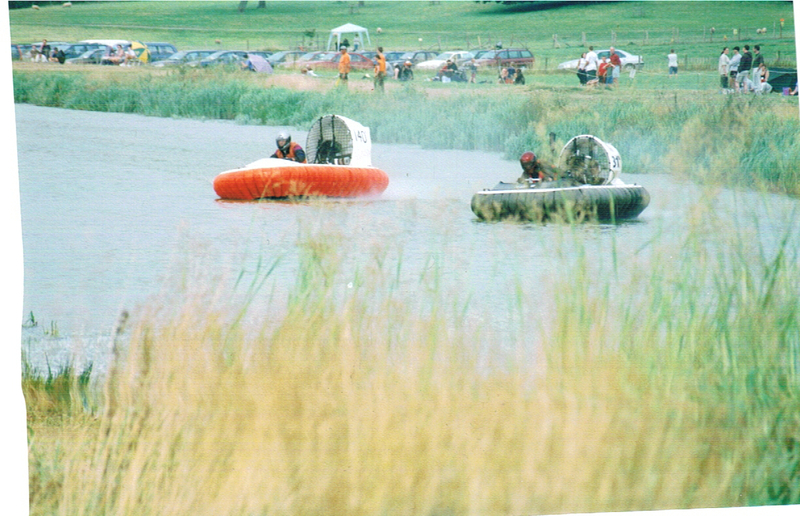 This is dedicated to my experiences hovercraft racing in the UK. Here in the UK, the racing season lasts from around May to September and a dedicated band visit various venues around the country from Fawley in the south to Acrington in the north, with various stops in between. Racing takes place over weekends with plenty of action from start to finish. For details of when and where we’re racing, check out the Hovercraft Club of Great Britain’s (HCGB) website. I joined the HCGB at the end of 1998 and soon after bought my hull (See below). It was well into 1999 by the time I’d finished building it and so it was at the end of the season before I got a race in. All racers must take part in a series of races as “Novices”. These are mixed formula, so you may be racing against craft with vastly different capabilities but are a great learning ground before you head out into the more fiercely fought world of the National Championships. 2000 was my first complete season and I spent it in Novices, battling against other Newbies who were also trying to qualify. You can read about my craft and how I put them together by working your way down the menu.